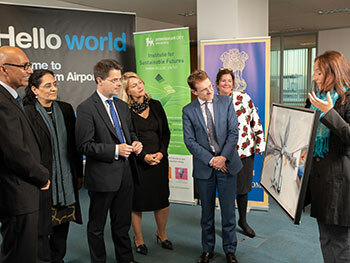 A student at Birmingham City University has presented the Secretary of State for Housing, Communities and Local Government, and the Mayor of the West Midlands with an award-winning piece of art that will be hand-delivered to the Indian Government as part of the first ever Midlands trade delegation to the Asian country. 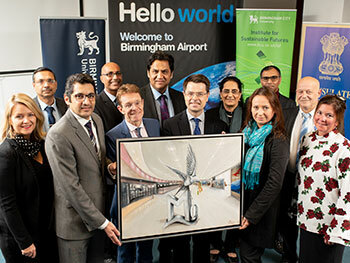 The competition set by Birmingham City University and MLTUK provided engineering and arts students with an opportunity to work closely with professional artists, designers, engineers, industrial partners and global organisations on this project. The judging panel was co-led by Rajinder Dudrah, Professor of Cultural Studies and Creative Industries at Birmingham City University, and Makhan Singh, Development Manager at the Institute for Sustainable Futures, which is part of Birmingham City University. 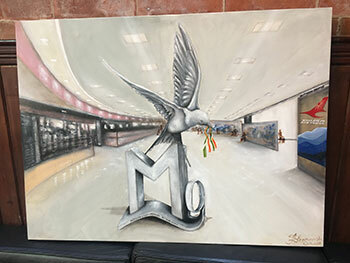 The competition to design the magnesium sculpture gave our students valuable exposure as they seek to forge their own careers in engineering and the arts, while it also reinforces our mission to develop sustainable solutions to problems facing society today. Birmingham City University and MLTUK agreed a strategic partnership last year, which has seen the two organisations work together in the education, research and development of magnesium use. The partnership is placing fuel efficiency through weight savings and sustainability at its core, and their second annual Magnesium Symposium will be held later this month on the University’s City Centre Campus in Birmingham.